Star Trek: Asterisk "Officer's Lounge - Operation: Alternative City!" *holds up Greyskull's Sword of Power* I have the POWER!!!! ...to bring you a new episode of Star Trek: Asterisk! 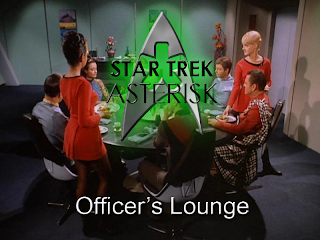 That's right, folks, it's time for another edition of the Officer's Lounge, where the Captain and I take you on an amazingly hilarious journey through Trek lore (no, not THAT Lore). We finally come to the end of season 1 of The Original Series with "The Alternative Factor", "The City on the Edge of Forever", and "Operation: Annihilate!" Join us in taking it out with a bang here. Also, go back and read Steve's written reviews (there's a trollface in there somewhere), and stay tuned tomorrow for the Aftermath. Plus, be sure to join us LIVE on Thursday at 6PM Eastern when we begin season 2! ALSO: Remember that Hailing Frequencies are OPEN! Feel free to call us with your Star Trek questions at 513-ASTRISK. You may just get your question played on air next week! Now be gone with you!